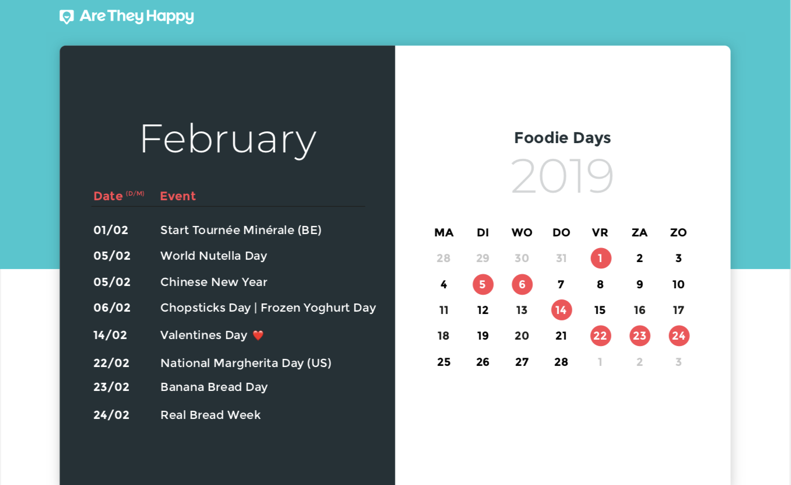 Welcome to the AreTheyHappy Foodie Days Calendar for the month of February! Now’s a good time to start preparing your content for next month. February is packed with traditional holidays, like Valentine’s Day. But, for those who want that extra twist, we have added a number of – lesser known – holidays. And let’s be honest: we couldn’t ignore World Nutella Day! With our free Foodie Days Calendar, you’ll have enough inspiration to fill this new month with awesome content! It gives you an overview of all the important foodie days of February. What will you find in this blog post? How to use the calendar? Download your foodie calendar as a pdf! Tip: click on the names of your favorite days to find out more! Would you like to get a reminder before the upcoming foodie days? You can add the days to your own Google Calendar by clicking here. Step 1: Use the calendar as a “base.” Mix and match the days that suit your restaurant brand and menu! Side note: There’s definitely no need to go overboard and squeeze all of the days in. Keep it relevant and pick the foodie days that match your concept and tone of voice. Step 2: Use a planning tool to schedule your posts. Read this article to find out more about “batching and the 30:30:30 Rule to content planning” your work for a stress-free month of social content. We’re going to give our usual Foodie Days blog a bit of a twist. We’d like to illustrate the best ways to create great social media content in the form of a fictional case study. 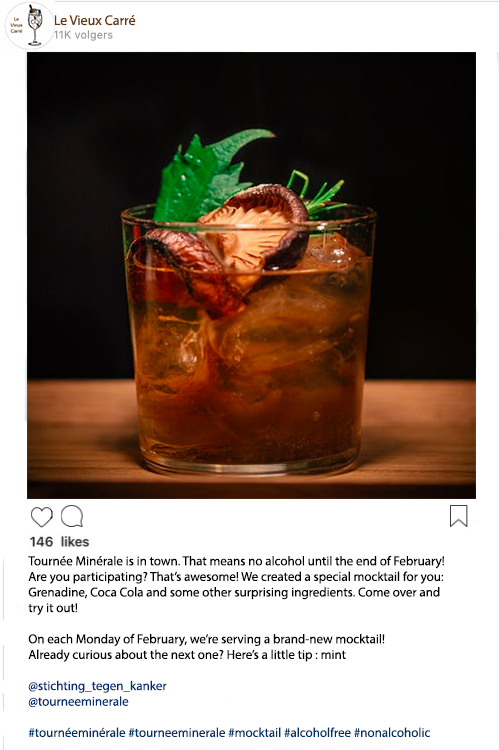 In this case, Le Vieux Carré, created a post for Tournée Minérale, an initiative in Belgium where people stop drinking alcohol for the full month of February. 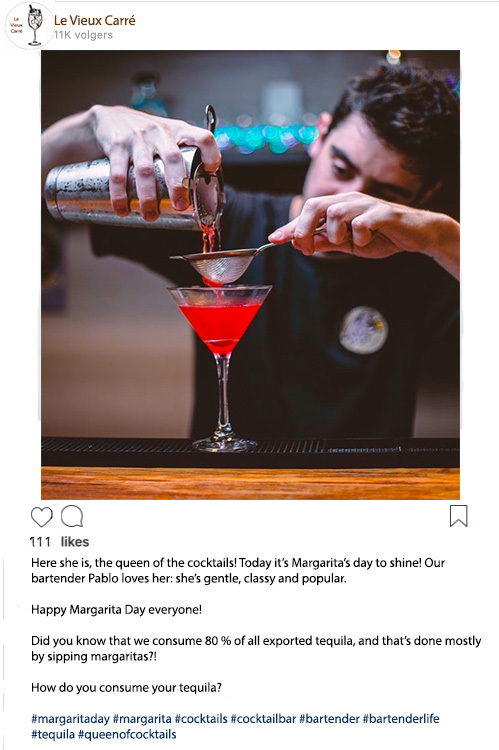 They tagged the brand they used for making their mocktail and the organisation of the event, to get more views! Le Vieux Carré chose a darker atmosphere to create a fancy and classy vibe (tip: choosing one filter can help!). Their pictures have a lot of brown and black colors in it, combined with a little touch of color. Can you also spot the wood in each picture? It’s just a small detail, but it adds so much consistency. Instagram is one of the most popular social networks worldwide. About 95 million photos and videos are shared on Instagram every single day, so standing out isn’t very easy. That’s where your Instagram Aesthetic comes in. An Instagram aesthetic or “theme” is the overall look and feel of your Instagram feed. You can call it a ‘vibe’, ‘mood’ or ‘soul’. 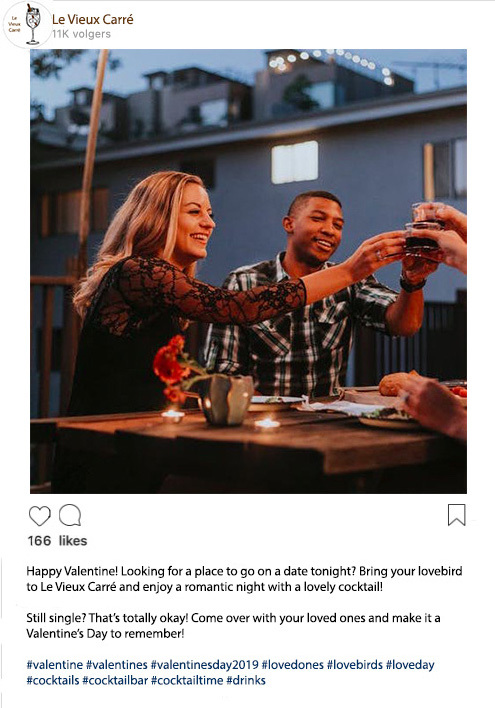 It’s the very first thing people notice when they visit your Instagram page, so it should align it with your restaurant’s branding. In order to attract followers and likes, you need to make sure it’s consistent and recognizable: i.e. maybe you have a returning color scheme? Or a recognizable style of photographs? What vibe do you want to create: colorful, minimalistic, dark? Our tip: Choose one, make sure it matches your restaurant and then stick to it. A Foodie Day is all about food, but that doesn’t mean that your photo can’t have people in it. Did you know that pictures of human faces are 38% more likely to receive likes than those of just objects? They’re also 32% more likely to attract comments. So, don’t be afraid to face it! Ask your customers if you can share their pictures and add some shots of your team for extra engagement. We hope our February Foodie Days Calendar inspires you to create awesome content this month! Want to learn more about social media marketing and review management? Check out our other blogposts! Discover what we can do for your business! Need some help with managing your social media channels? Find out what we can do for your business in this explainer video! Or get started on a FREE 2-week trial today and start owning your online reputation! How do I convert followers on social media into actual customers? What is the Online Reputation Management Cycle and why does it matter?